The (Online) Nanny Diaries: Giveaway! According to the etsy site, the bracelet's pieces were all handmade, and the turquoise color was chosen to ward off the 'evil eye.' (And it came from Israel. Really!) I can't tell you how cool I thought that was -- and how excited I was that I had won! I've worn this bracelet a few times now and I love it. I've gotten so many compliments on it! "This unique and gentle bracelet combines four turquoise amulets: Hamsa (The small hand-5 fingers), Garlic, An eye, and one turquoise bid. All amulets are symbols of good energies and luck keepers, and also evil-eye watchers." Please leave an email address in each comment you leave so I can contact you if you win! Contest ends 11/4 (ONE WEEK!!!). Cute bracelet. I need an evil eye watcher! Love the bracelet. My day was not good, but it stopped raining. I love the hamsa symbol and the look of this bracelet stand-outs and is very pretty . I have subscribed to your blog lines through google reader . Thank you !! I'm a blog fllower too. Oh and I forgot to put my email add on my previous posts. How was my day? well, yesterday we found out I'm pregnant! So it's been good. :) I would so use the bracelet as a birthing bracelet. Well I got to volunteer at my daughter's playschool for the halloween party so that was fun but my husband was critising so many things today that it bummed me out. Lovely bracelet! I'd love to win it... or maybe some nanny-tips? I've had an exhausting night. My sons (16 months old and 2 1/2 years old) were up half the night, scared of the thunder and demanding I stay in their room. Found myself lying on the rug at 4am, hugging a teddy. Lots of gorgeous stuff in that Etsy store ! and...so nice from you to give away it!!!!! I have a bad evening as my friend keeps asking to buy a water filter that cost RM3,000 over which I cannot afford. Weather is hot here in Malaysia. I had a teacher who was so superstitious about the evil eye she had a tattoo to ward it off. She unfortunately (in that regard anyways) had alot of influence on me. I had a seriously wonderful day!!! 75 degree weather here in Georgia, a good run, and a wonderful day with my son!!!! We went to Halloween party. Fantastic! I need something to protect me from the evil eye. Maybe it will stop my kids from licking other people's vehicles. 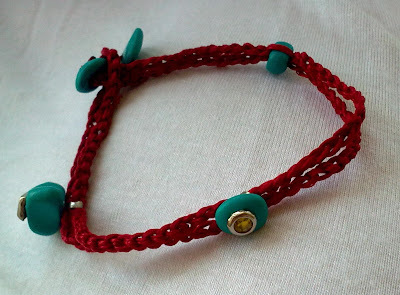 I would really love a chance to win this cute and adorable bracelet please! Hi..I am new too so, good luck to us! !Happy Halloween or weekend whichever suits. My son is the Person of the Week in his kindergarten class - he was so excited to get to school this morning! My day was terribly inefficient: I spent nearly 8 hours doing "bits & pieces" in the house (it kept pouring rain most of the day here)while... surfing craft blogs! I am new to your blog, but I like what I have read so far. Very cute bracelet. Hi, i would like to enter your giveaway. my days are the same and without changes... unfortunately i ve lost my job and i dont have any new one. Thanks. Gorgeous bracelet! Thanks so much for the chance to win your awesome giveaway! theonlinenannydiaries.blogspot.com is very informative. The article is very professionally written. I enjoy reading theonlinenannydiaries.blogspot.com every day. "If there was ever someone I'd want to be a sheep in a bowtie with, it'd be you."